Hi!! 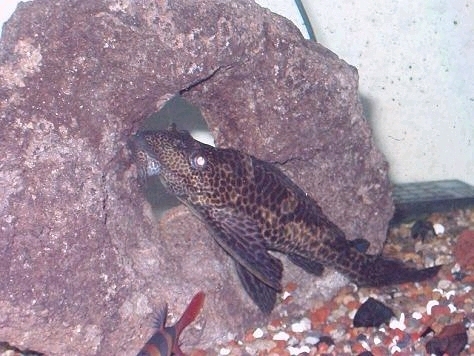 My name is Fred and I'm a plecostomus. I'm here to tell you a little bit about myself and my other fish friends who live with me, and my people friends who look after us. I live in a 55 gallon aquarium with 2 clown loaches, a pair of silver dollars, a couple of needle nose gar, two angelfish, two albino cory cats, and a few goldfish who keep disappearing thanks to mama and daddy gar. These fish are all much smaller than the fish who live with me. Since my lazy owner hasn't updated this site in months, I guess I'll have to do it myself. There have been a few changes around here....Daddy gar broke his jaw against the glass, got in a pissy mood, and killed mama gar, so there are no more gar here. The angels all moved to the 29, the cardinals, silver dollars, and clown loaches all moved into a brand new 125. I'm still here in the 55 with a bunch of goldfish, 2 newts, and 2 crawdads. I'll try to get my owners to take some pics of my new housemates soon. Our new neighbors in the 125 include 2 discus, and a bala shark, along with a few guppies. I sure wish that Brad guy would keep on top of things cuz its sure hard to type underwater. We've had a few more changes around here .... I'm now living in the 125 with 5 discus, 3 angels, 5 sterbai corys, 5 albino corys, 2 green corys, the clown loaches, glass cats, guppies, frogs, and a chocolate albino pleco. The silver dollars are alone in the 55 now (we have 5). Besides the two big tanks, we have 3 tanks with breeder angels, a grow out tank for the babies, a hospital tank, 3 empty grow out tanks, that should be full soon, a hospital tank, and a tank with orandas and corys. I'm sure this will all change in the next few weeks so check back soon! We now have new sections on breeding angelfish and albino corys (not up yet, working on it now, check back real soon).